Android migrates to autos -- but will it dominate? Continental AG's Android-based AutoLinQ telematics system would allow motorists to download a variety of useful apps, such as a tire pressure monitor for your smartphone. Editor's note: An earlier version of this story incorrectly spelled the last name of Marcello Tamietti. Google Inc.'s Android operating system, installed in about a third of new smart phones globally, is expanding steadily into automotive telematics. Two major suppliers, Magneti Marelli S.p.A. and Continental AG, each have developed in-car telematics units using Android. With Android in the car, apps from Android phones could be used more easily by drivers and passengers. But one expert predicts automakers will control tightly the use of apps in their cars. Magneti Marelli, which developed its system in a partnership with Accenture, will launch the system this year, said Marcello Tamietti, Accenture's telematics expert based in Turin. "We are developing one of the first Android-based platforms for telematics," Tamietti said. "We cannot disclose the name [of the partnership's customer], but it will be this year for sure." Meanwhile, Continental is marketing AutoLinQ, a telematics system that uses Android's Linux-based operating system. Android is growing into a communications powerhouse. According to The Wall Street Journal, shipments of Android-based smart phones topped 33 million units in the fourth quarter, giving Android a third of the global market. Consumers can choose among about 200,000 Android apps, and automakers are taking steps to make their telematics systems Android-friendly. Last June Chrysler Group announced plans to make the Jeep Grand Cherokee's vehicle data accessible via iPhone, Blackberry and Android smart phones. In October, General Motors Co. announced plans to let Chevrolet, Buick, GMC and Cadillac owners view their OnStar vehicle information on Android phones. Last year Shanghai Automotive Industry Corp. became the first automaker to launch a car, the Roewe 350 sedan, whose telematics system uses Android's operating system. 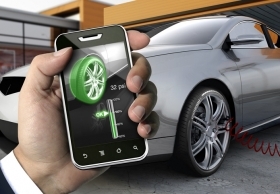 Magneti Marelli and Accenture are adopting Android as their telematics unit's operating system. Here's how it will work: When the customer buys a car, it will come loaded with a no-frills assortment of applications. The car buyer subsequently could go to Android's online store and choose from a long list of automotive applications. Tamietti says the trick is to make sure that the telematics system can integrate the car's own data with Android's applications. For example, if your car is low on gasoline, an Android app might show you where to find a station that accepts your credit card. Since Android already boasts 200,000 applications, one might expect it to shove aside rival operating systems developed by Microsoft, QNX (a division of Blackberry producer Research in Motion Ltd.) and others for the telematics market. But it's not that simple. Mark Boyadjis, a senior telematics analyst for IHS iSuppli, says automakers will insist on complete control over the user interface of their telematics systems. Automakers must make sure their telematics systems are safe and easy to use. And they tend to be conservative about such things. Ford Motor Co. is a case in point. While Sync has enjoyed wide acceptance, Ford has not deluged users with a blizzard of features. Last October Ford disclosed that it was reviewing 1,000 proposals by software developers for Sync, which employs a Microsoft operating system. So far Ford has approved three. Motorists can use Sync to access Pandora Internet radio; Stitcher, an online news radio service; and OpenBeak, which offers access to Twitter. Sync's list of apps will expand on a regular basis, says Ford spokesman Alan Hall. But Ford retains the final say. "We have very strict guidelines," Hall said. "The driver's experience in the car is our responsibility." Experienced suppliers such as Magneti Marelli and Continental AG presumably can demonstrate the safety of their Android-friendly systems to their customers. But if other automakers are as conservative as Ford, Android's 200,000 applications may not be a decisive advantage, argues Boyadjis of IHS. Instead, rival software developers Microsoft and QNX - with "years and years of experience" in telematics - may have a bigger edge, he says. At this early stage, Boyadjis and other analysts can only speculate which software developers will prevail. But everyone agrees that telematics is going to have a huge growth spurt. To stay on top of this industry, automakers will need a software system that the motorist can easily - and frequently - upgrade, Tamietti says. "When you look at a car in the showroom today, it was designed when the iPhone did not exist," he says. "What will we have in two or three years? Nobody knows."